On what may have been the biggest night for Democrats all year, Secretary of State Hillary Clinton spoke to a packed house in Portland on Tuesday night — and celebrated along with them. "Boy, I have a lot more hope tonight," Clinton said to raucous applause at the Arlene Schnitzer Concert Hall, just minutes after the Alabama Senate race results broke in favor of Democratic candidate Doug Jones. Jones' victory over Republican Roy Moore — endorsed by President Donald Trump despite being accused of preying on young girls — means the Democrats are one seat closer to closing the Republican majority in the U.S. Senate. "I can't thank you enough for being here to celebrate Doug Jones' victory," Clinton told the partisan and heavily female crowd. 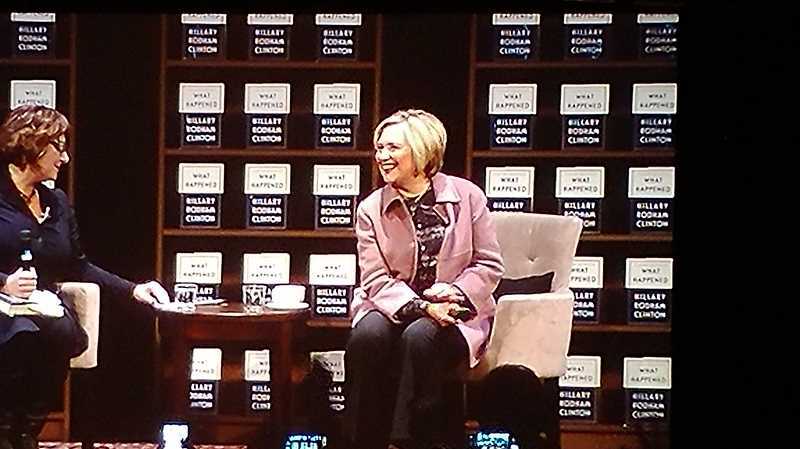 Clinton, interviewed on stage by New York Times columnist Jennifer Weiner, stuck to the themes of her book, blaming her loss on a "perfect storm" of events largely beyond her control, but the polarizing presence of Moore, and the sexual assault allegations that dogged him all fall, was palpable. She predicted polls in Alabama would show that many women who voted for Trump refused to vote of Moore, and that Jones' victory would spur a new crop of candidates which would include many women. "There's a feeling in the country that this is the time for women to stand up," she said. "The lesson for me tonight is that we to have to contest everything. And I believe that if we do that in 2018 we can take back the House and the Senate." She said the forces that worked against her are still potent, but that the Doug Jones improbable victory should give Democrats — and particularly Democratic women — hope. 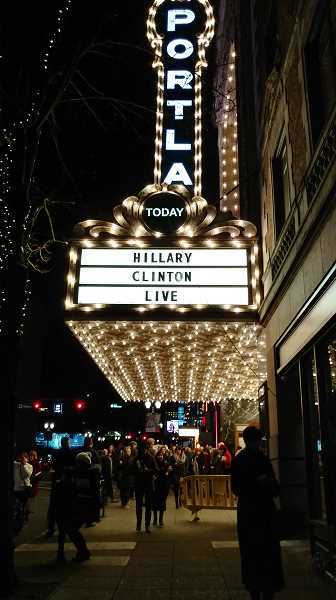 Clinton came to Portland on the tail end of her 16-city book tour for "What Happened," which she wrote after winning the popular vote in 2016, but losing the presidency to Trump. Groups with pro-Trump signs and others with anti-Trump messages faced off outside the concert hall on Southwest Broadway. During the event, Clinton wove in many of the same anecdotes and laugh lines from the book — which covers everything from how she personally coped (long walks and glasses of Chardonnay), the Russia investigation, James Comey's investigation into her email server, mistakes she's made, sexism in politics, and the works she's doing to help young people — especially women — to stand up and get involved in activism through her new nonprofit, Onward Together. Since the 2016 election, thanks to grassroots efforts like Emily's List and She Should Run, 369 women have announced they will run for Congress in 2018, the moderator noted. "How does it feel, to have lit that fire?" Weiner asked. "The lesson to me, from what we learned to night," Clinton responded, "is (that) we have to contest everything. We have to be there to make our case. If we do that in 2018, I believe we can take back the House and Senate." She spoke at length about the public shaming that comes with running for office as a woman, when people dissect a female candidate's weight, hairstyle, clothing, voice and habits as a mother and wife — when male candidates rarely receive the same scrutiny. "The more women we get involved, the more that will recede," she said. Throughout her talk, Clinton did not mention Trump by name, but did not hold back with biting criticism. A few dozen protesters and counter-protesters gathered outside the event, chanting at each other from across Southwest Broadway and Main streets. But there was a peaceful police presence and no incidents of note. On Russian interference in elections: "It'a a clear and present danger to American democracy, right out of a movie plot. … The Russians are still playing. … If you're an American, you have to help us confront this urgent threat." On voter suppression at the polls: "It's a blast from the Jim Crow era. This is the civil rights issue of our time." On alternative facts: "There is no such thing as an alternative fact. It is insidious and subversive to our democracy." On Trump's response to the Robert Mueller investigation: "If he were to fire Mueller, it would be a terrible mistake for him, and a political disaster for Republicans. It would be a constitutional crisis (akin to Nixon's actions). ... If something that dramatic were to happen, it would focus everybody's attention on (the investigation). I hope he doesn't (fire Mueller), for the sake of the country." On Trump's job performance: "Past presidents actually did spend more time on the job. ... He doesn't do anything a president usually does to make difficult decisions. ... The president is indifferent to and event contemptuous of differences. What does he do all day besides drink Diet Coke, watch TV and play golf on weekends?" On Trump's tweet disparaging New York Sen. Kristin Gillibrand, one of at least four senators who have called for an investigation into Trump's sexual misconduct: "He didn't attack the other three men. I think she's handled it great. She's defied him, stood up to him. I'm very proud of her." On the title of her book: "I had a hunderd different titles. Even this title had a little more pizazz. I became dissuaded from 'WTF Happened.'" In a "lightning round," moderator Jennifer Weiner — a gender and culture writer for the New York Times — peppered Clinton with questions on a variety of lighthearted subjects, eliciting chuckles from the crowd. Clinton chose hamburgers over hot dogs, mustard over ketchup, savory over sweet brunches and admitted to keeping hot sauce in her bag, a habit of 25 years, long before Beyonce. "But I don't sing about it," she quipped. After Portland, Clinton says she has two more book tour stops — in Vancouver, B.C. and Los Angeles — then a few more book-related events, then is eager to spend time with her grandchildren, age 3 years and 18 months. She'll also do some holiday shopping; when asked what she's getting her husband, the former president, she joked that she's run out of ideas. "I don't know; I've been creative for years," Clinton said, noting that she's bought him everything related to golf, books and more books, and clothes that he likes "but then goes back to what he's worn for decades." She said since her husband's heart bypass in 2004, he's kept a heart-healthy diet of no meat or diary, but has added fish. Read the Tribune's Nov. 7 story about Hillary Clinton coming to Portland here. Pamplin Media Group Executive Editor John Schrag contributed to this story.